Cotton Blend Cosmetic Bags with Hill Tribe Applique (pair), "Lisu Rainforest"
Thai Tribal Crafts presents a pair of versatile cosmetic bags highlighting the unique appliqué work of the Lisu hill tribe. Featuring teal borders, the appliqué composition is sewn in shades of green, purple, blue, teal and red. Both pouches are lined in black and close with a zipper. Only the big bag has an inner pocket. 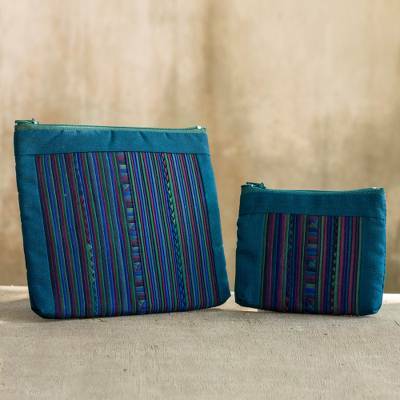 You can find cotton blend cosmetic bags 'Lisu Rainforest' (pair) by Thai Tribal Crafts in handbags categories such as Hill Tribe Handbags, Rayon Handbags and Cosmetic Bags Handbags. Enjoy exploring these sections for other Novica treasures. These bags are amazing. The detail, color, fabric and stitching is just gorgeous!! They are way more beautiful than I expected.